The early Egyptians, a highly advanced society, used astronomy to predict the Nile’s flooding cycle and thus reap the bounty of its annual inundation. This enabled them to produce abundant crops, which they stored in large granaries as protection against starvation. Militarily powerful, the Egyptians vanquished their human rivals but were defeated by the smallest of foes: the rodent. Rodents gobbled up large quantities of their grain stores and fouled the rest, and the inability to control these pests became a serious threat to survival. The Egyptians began using weasels to catch rodents in their granaries, but these animals proved untamable, smelly, and inefficient at killing rats. In addition, they often targeted domestic fowl and their eggs, as well as other animals the Egyptians depended upon for sustenance. It’s not known exactly when the first small local wild cats, members of the subspecies Felis silvestris lybica (African wildcat), wandered into human settlements (estimates range from 5,000 to 10,000 years ago). New evidence suggests that cats were actually domesticated within the Fertile Crescent rather than Egypt, and later made their way into Egyptian households. When people realized that cats could protect their food stores from rodents, they may have begun putting out scraps such as fish heads to encourage regular visits. This symbiotic arrangement would have eventually led to domestication as the friendliest wild cats made their way into homes and raised kittens among their human companions. The most outgoing and amenable cats would have been the first to make contact with people, and thus became the ancestors of the modern domestic feline. Cats were enthusiastically embraced by the Egyptian people, who found them far more agreeable company than their weasel predecessors. In addition to being highly effective rodent catchers, felines were good at eliminating the many poisonous snakes in the area. Over time, breeding programs and reduced need for desert camouflage led to the more diverse, smaller feline types that are abundant today. In addition to being saviours of food stores, cats possessed many traits admired by the Egyptians – beauty, elegance, cleanliness, grace, and excellent mothering skills. Cats soon became fixtures in the day-to-day life of the Egyptians. Miut (“female cat”) was a popular name for girls, and seeing a cat in a dream was believed to predict a bountiful harvest. Cats were known as “miu” (“one who mews”), a word that may also be related to “Miw,” meaning “to see,” reflecting their mystical associations. Ancient Egyptian cats not only caught mice, rats, and snakes, but were also taken on hunting excursions. Some historians believe that they were trained to retrieve fish and fowl for human hunters, as scenes of cats assisting hunters are depicted in Egyptian artwork. 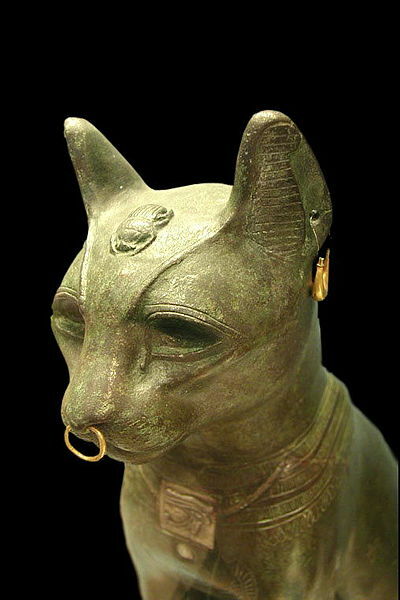 Cats featured prominently in Egyptian jewellery, statuary, and other ornamentation, and also in Egypt’s pantheon of gods and goddesses. The best-known cat goddess, Bast, whose name translates roughly as “Devourer,” was the daughter of the Egyptian sun god Ra. Originally a war goddess, in later years Bast became associated with happiness, sensual pleasures, fertility, and the domestic sphere, providing protection for women, children, and cats. Another Egyptian feline goddess was the lion-headed Sekhmet, or “Powerful One.” Sekhmet, a goddess of pestilence and war, was sent by Ra to punish mankind for their failure to maintain his laws and preserve justice. Ra sent Sekhmet on a rampage, but when he saw the resulting carnage, he repented and requested that she cease her violence. But Sekhmet’s bloodlust would not abate so he doused her path with beer dyed red with pomegranate juice, tricking her into believing that it was blood. Sekhmet gorged on this “blood” and became so drunk that she fell into a deep sleep for several days, after which her violent urges had dissipated. Sekhmet thereafter became a protector of balance and justice. She also had the power to cause disease and to cure it, and so Egyptian physicians were also Sekhmet’s priests. The Egyptians sought to hang onto their feline treasure and made the exporting of cats illegal, even going so far as to occasionally send armies to retrieve those cats that had been shipped to foreign lands, but they were ultimately unsuccessful. By 900 BC, smugglers were transporting domestic felines to Greece, Italy, and beyond. While those in other places prized cats for their rat catching abilities, they never appreciated them in a spiritual way as the Egyptians did, though cats were viewed as symbols of liberty in Rome. Cats were so profoundly valued in Egypt that killing a cat was punishable by death, and when a beloved pet cat died, human members of the household shaved their eyebrows in mourning. Cats were mummified just as people were, and saucers of milk and rodents were placed in their tombs. However, evidence suggests that not all of the mummified cats died of natural causes. Some may have been sacrificed to Bast. The Egyptians even lost a battle because of their reverence for cats. The Persian army, knowing that the Egyptians would be difficult to defeat, devised a cunning plan. Persian soldiers arrived carrying cats and released them onto the battlefield. The Egyptian army surrendered rather than risk harming any of the precious felines. For more feline history, see the Cat History page. For a full list of cat articles, see the main Cats page. For dog articles, see the main Dogs page. Christensen, Wendy. (2002). The Humane Society of the United States Complete Guide to Cat Care. New York: St. Martin’s Press. Hill, Jenny. (n.d.). “Cats in Ancient Egypt,” “Bast,” and “Sekhmet.” AncientEgyptOnline.co.uk. Springer, Ilene. (2001). “The Cat in Ancient Egypt.” Tour Egypt Monthly. Thank you for your valuable writing. I have a question. Have any written document of the”Cat Goddesses of Ancient Egypt: Bast and Sekhmet”?? If you find any document then please share with me.